Do you have a collection of a few or many high-end jewelry pieces? Your goal may be to value the collection for estate planning purposes, or you may want to ensure you have the right amount of insurance coverage. Either way, Dover Jewelry will help you protect your Valuables and secure your investments by preserving the Rare and Exceptional Integrity of your fine jewelry.is ready to be your jewelry appraiser. As one of the leading fine jewelry re-sellers and consigners of antique, vintage and unique jewelry, we constantly work with individuals and estates, providing Trust and Transparency all in a timely manner. Our estate diamond jewelry grading services are top-notch and can take place no matter where you live. From our headquarters in Miami, FL, we can expertly examine and evaluate your gemstone estate jewelry using cutting-edge technology. Our Jewelry Appraisal Services provide expert written appraisal reports for Insurance Coverage, Probate, Dissolution of Marriage, Bankruptcy and tax purposes. Each appraisal certificate outlines the intrinsic and specific attributes of your item to include type of metal, quality, cut, age and appraised insurance value. Talk to us today about our estate jewelry appraisal services. You may discover timeless or rare pieces in your collection you didn’t realize were worth far more than you expected or knew. Confidential advice and valuations for family division, estate tax, insurance, sale advice including auction and consignment recommendations. Verify the value and authenticity of your gems with an Updated Certified Appraisal by Dover’s GIA Gemologists. Full-service evaluations in the privacy & security of our Miami offices, your business or Banking institution. Why would someone who wasn’t planning to sell their jewelry collection need an appraisal? For many, it’s a way of making certain their assets are protected. Estate planners often recommend a thorough appraisal of all fine jewelry before outlining any type of estate plan. Plus, insurance companies may require an appraiser’s feedback in order to provide adequate coverage against jewelry loss or damages. Plus, some people who contact Dover Jewelry have inherited jewelry pieces they think may be valuable but aren’t sure of the gemstones’ authenticity. Whether an individual piece or entire estate, we can help them gain a better understanding of the jewelry pieces they own, as well as give them a thorough background on the metals used, quality of gemstones and much more. Our areas of expertise include: Jewelry, Diamonds, Gemstones, Watches, Luxury Accessories, Coins & Currency, Fine Art, Antiques and silver pieces. Our job as a high-end estate jewelry appraiser is to investigate your jewelry and give you peace of mind. Contact our team to learn more and get the process started. Remember that your jewelry does not have to be vintage or antique for us to appraise it. We frequently appraise modern fine jewelry, such as diamond wedding bands, precious gemstone rings and earrings and much more. Our Consultation expertise can be useful for the sale of personal property, and advice on the best sales venues. Diamond Consultation and Guidance for Buyers, Updated Certification for Insurance Coverage, Brokering or Selling of Unwanted Jewelry, Diamonds and Gems. We will find you the best buyer for your unwanted Jewelry, and offer FREE consultations and estimates of fees before any work is rendered. 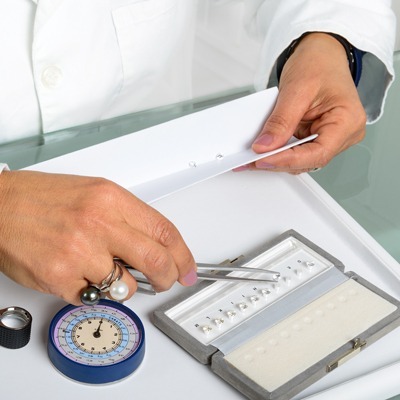 Verify the Value and Authenticity of your Jewelry with an Updated Certified Appraisal by Dover’s GIA Gemologists. Our clientele consists of Someone Just Like You! Protecting your valuables while providing an unsurpassed level of Discrete estate evaluations for attorneys, CPAs, Creditors, Grantors and beneficiaries, Insurance professionals, Investment advisors, Trust and Estate offices, Charities and Federal organizations. If you are interested in selling or consigning with Dover Jewelry, connect with our team members in Miami, FL, and we’ll start the conversation. We’re always excited when we have the opportunity to look through estate treasures and evaluate pre-owned merchandise.